The envelope, is made of a reinforced fabric called rip-stop nylon (some balloons are made of acron). The material is very light weight and strong. The fabric is coated on the inside to prevent leaks. The baskets are made from rattan and each one is individually woven by hand. First the envelope is stretched out on the ground and attached to the basket, which is lying on its side. A small gasoline-powered fan blows air into the balloon. Then the burner is turned on, and the air in the balloon is heated. The hot air rises, lifting the balloon upright. Since a balloon is quite unwieldy on the ground, especially in gusty winds, it takes about four people to get the balloon inflated. Of course, the more people there are, the more fun you can have. The typical sport balloons range in size from 65,000 to 105,000 cubic feet in volume and stand about 70 feet tall. The balloon goes where the wind takes it. However, the winds at varying altitudes may blow in different directions and at different speeds, so the trick is to climb or descend to an altitude where the wind is blowing in the direction you want to go. As fast as the wind. Or as slow, Since the balloon has no forward propulsion system, its speed is determined entirely by the speed of the wind. That’s why balloon races are strictly races of accuracy not speed. Usually just after sunrise and one or two hours before sunset. This is when winds are calmest and the air most stable. Most balloon flights occur between 500 and 1,000 feet above the ground. But balloons can fly at just above the ground or go much higher. The world record for altitude in a hot air balloon is 64,997 feet. How long can it stay up? Normally, the balloon carries enough fuel to remain aloft for about 2 hours. Factors like outside air temperature, weight being carried in the basket and weather determine the duration of the flight. 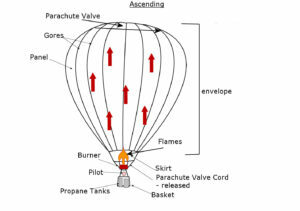 Hot Air Balloons use propane, kept in pressurized tanks in the basket. The tanks are connected to burners with aircraft certified flexible hoses. When the burner valves are opened, the propane is ignited by a pilot light in the burner. The flame may shoot out as much as ten or twenty feet, making a loud “whoosh.”. Generally balloons carries 30-40 gallons of liquid propane. With the help of a chase crew who drive a recovery vehicle. The chase crew follows the flight of the balloon trying to stay parallel or ahead of the balloon and should be on hand to make the recovery when the balloon touches down. Do you need a license to pilot a balloon? Yes. A Balloon Pilot Certificate is required by the Federal Aviation Administration. You must pass an FAA written exam, have a prescribed number of hours of flight instruction in a balloon, make a solo flight and a flight to altitude, pass a flight test and oral exam with a designated fight examiner and submit a medical statement.